Active Duty Member - $25.00 (USD) Subscription period: Unlimited One-time fee, while on active duty! 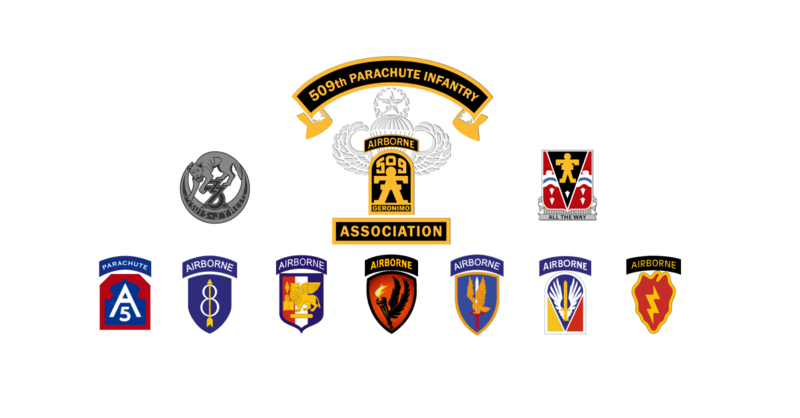 Includes any Soldier currently serving in the U.S. Army, Navy, Air Force, Marine Corps or Coast Guard who is, or has been, assigned to a properly constituted unit of the U.S. Army organized under the heraldry and lineage of the 509th Parachute Infantry Regiment. Associate Member - $25.00 (USD) Subscription period: 1 year No automatically recurring payments Any family member of a deceased Charter and Regular Member of the 509th, other than Legacy Members, or any other individual who supports the aims and purposes of the Association may become a member of the Association with approval of the Executive Committee. Charter Member (WWII Veteran) - Free Subscription period: Unlimited Charter Members shall consist of all officers and enlisted persons assigned to the 504th Parachute Infantry Battalion, the 2nd Battalion 503rd Parachute Infantry Regiment (from February 24, 1942 through November 2, 1942), the 2nd Battalion 509th Parachute Infantry Regiment and/or the 509th Parachute Infantry Battalion, between October 4, 1941 and March 1945. Charter members shall also be LIFE MEMBERS, with NO DUES being necessary to continue their membership in the Association. Honorary Member - Free Subscription period: Unlimited Any person, whose life and activities has fostered the ideals of the 509th Parachute Infantry to the general public or whose service to the Association has be exemplary, may be elected an HONORARY MEMBER of the Association by majority vote of the Executive Committee. Honorary Members are EXEMPT from paying dues, per the by-laws. Legacy Member - $20.00 (USD) Subscription period: 1 year No automatically recurring payments Widows and Children of deceased Charter and Regular Members of the 509th Parachute Infantry. Regular Member - $25.00 (USD) Subscription period: 1 year No automatically recurring payments Any officer or enlisted Soldier, who has been assigned or attached to, and honorably served with, the 509th Parachute Infantry by whatever designation and whatever location since 1963, under competent orders, shall be eligible for membership in the Association.